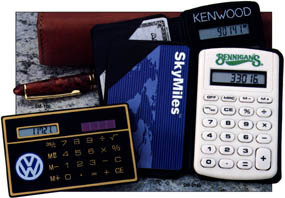 SM-3100 Solar-Powered calculator is a ultra thin credit card size with eight digit LCD display. SM-3115 Compact-Size calculator is perfect for briefcase, pocket or purse. Features a easy to read LCD display and a black vinyl cover.